Fortunately, Jill is a tough lady. She can run, jump, and skillfully use her knife and spinning blade. Want to really trick Jill’s opponents? Find the magical icons, and Jill will transform into a flaming bird, a leaping frog, or even better, a fish who can shoot bullets! 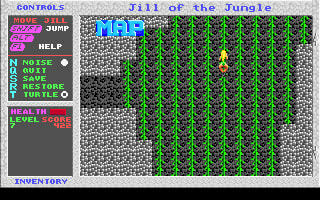 Even though Jill is prepared for the dangers of the jungle, helping her complete her mission will not be easy. Do you have the courage to help her?